If Brexit is a game of chess, the words from Chess, The Musical in the song 'Nobody's on Nobody's side' fit perfectly. Tim Rice was truly prescient. There is a fragment of a chessboard with two pawns on adjacent squares. One is marked with the Union flag and the other with stars like the EU. Is a collection of urban myths you hear from a friend of a friend. It's based on the WWII tale that meat was rationed so people ate whale meat. Some are mildly believable. Most are obvious myths. A few Chess related stories. Two Russian Grandmasters sat opposite each other at the chessboard. After thirteen hours one of them exclaimed: "My God! Is it my move?" "Where were the wise women?" name of the town 'Scheveningen'. I think Scheveningen and Groningen are both relatively easy, provided you remember that both ch and g are pronounced as a guttural, as in buch. Garry Kasparov presented some problems. He made the conscious decision to become Garry rather than Harry. We just don't have a way of representing that sound in the 26 letters of the alphabet. Players often speaking of coming to Gastings. My own Hebrew name has that problem. Solmen Ben Yitschok. It is relatively that is the key. Chroninchen is quite difficult as is Schveninchen, The Dutch word for helicopter is also a sight for sore ears. But I find the click language impossible and Polish only slightly less so. I only learnt to say, Prcwewoznik by starting the name by sneezing. I am sure I have spelt that incorrectly. I was telephoned by the Georgians about an invitation for one of their players at the time of the start of the Soviet Union diaspora. It sounded like Mr Jam jar. So I asked for his rating and and realised it was Dzhindzhava. He duly came to Hastings and I realised FIDE had his name wrong. It should have been Dzhindzhgava. I arranged for the correction. Then the USSR broke up and they used Jinjgava. I wasn't paying much attention to the TV yesterday. But I think I saw an ad for Revlon which included a chess set. I was sitting outside a bar in Valdepeñas on Tuesday and was surprised to see, through the window, that the bar's TV set appeared to be showing snooker. Shortly it transpired that it was a film and the characters in the movie, who had been portrayed watching snooker, were very soon after shown with a chess set. Checking the schedules later revealed that the film, 6 Days, is set during the Iranian Embassy siege, which explains the snooker. But for the chess set, I have no explanation. Justin Horton. Bob Basalla, who collects all mentions of chess in films, thanked you for your post about 6 days. In today's Sunday Times, Business section there is n extensive profile of RICHARD BRANSON. At its conclusion there is a section 'DOWNTIME'. The 67 year old is an avid kite surfer. Branson also liked to play chess and sail. When the BCF was seeking an 'outside' P resident in about 1992, we contacted Richard about the possibility of his becoming President. That was virtually a cold call as nobody had a personal contact. He turned down the invitation. The latest edition of Chess picks this up, but for those who don't subscribe, some recently unearthed Turing papers have correspondence with BH Wood. In an example of consistent branding, the letter head is instantly recognisable to those old enough. According to Chess, the correspondence was about chess engines, with BH asking Turing to confirm that he had invented one. Harry Golombek said Turing was a queen odds player. 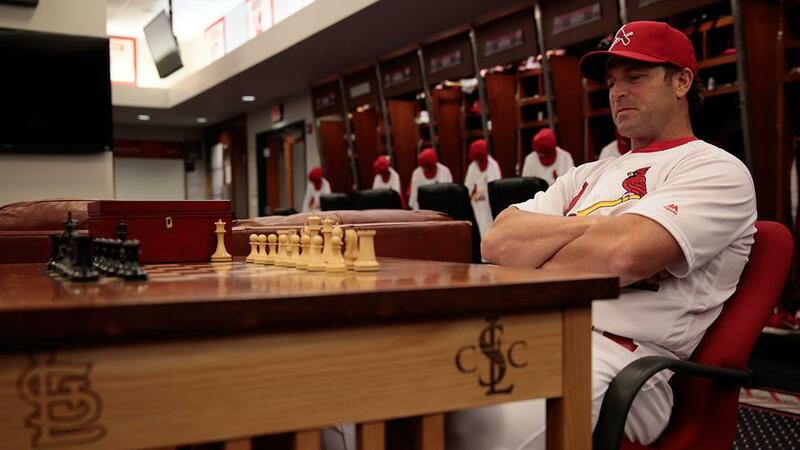 ST. LOUIS -- Cardinals manager Mike Matheny is an avid chess player. Managing a baseball game is a lot like chess. Sometimes the moves work. Sometimes they don't. Matheny pulled out every move he had against Pittsburgh on Thursday night at Busch Stadium, and he finally got his checkmate in a 10-8 victory over the Pirates thanks to a three-run walk-off home run by Yairo Munoz, which capped a five-run rally in the bottom of the ninth. it helped manage post-concussion symptoms.